I hope you will find the research given on this page both interesting and useful. The following reports give details of research studies that have been carried out into Reflexology. They are given for information purposes only, are courtesy of the named providers, with whom Copyright remains. Interventions For Leg Edema And Varicosities In Pregnancy - What Evidence? Can Reflexology Help Clients With Serious Mental Illness? The use of reflexology given by midwives to help induce labour in overdue pregnancies. Mothers-to-be at Walsall Manor pleased with results. Donna Waddison was "ready to pop" and prepared to try anything after going overdue with her third child. So when the 36-year-old from Walsall heard about a pilot reflexology scheme at her local hospital she was eager to sign up. And, after giving birth to son Harley barely two hours after going into hospital, Donna is convinced that the relaxing foot treatment she received certainly did the trick. Donna, who has two other children – Oliver, aged seven, and Ellie-Mae, five – said: "It was just amazing and totally relaxing. If only this had been available with my other children. Those births were OK but not as settling and relaxing as this one." It was while attending weekly antenatal classes at Pinfold Health Centre in Bloxwich that Donna came into contact with one of the Walsall midwives specially trained in reflexology. Walsall mother-to-be "ready to pop"
The mum-to-be said: "I was already a day over my 40 weeks when I spoke to my midwife, Anna, at one of the antenatal classes. I was lucky that she was one of the reflexologists, so she booked me in for my one-hour session at the Manor Hospital. "I was ready to pop and had had enough. And you will try just about anything when you are overdue." The session began with the midwife putting on soothing background music. "You lay down on the bed and the midwife explains the different points on your feet and legs. "She then touches various areas such as the balls of your feet, the backs of your calfs and the sides of your legs. It’s just like going into a spa and having a pamper day, a bit like having a massage. "It’s lovely and just puts you in a nice relaxed frame of mind. It also helped relieve the pressure on my feet and reduce the swelling on my ankles. And my feet were so soft afterwards because they use a lavender cream." Pain-free birth after reflexology session. Donna said another important part of the reflexology centred around pain control for when she went into labour. "They tell you that the pain is all in the mind and, certainly, I had no pain relief while I was in labour with Harley. "I didn’t go into labour straight away after having the reflexology but from then on I was ready. And my husband, Philip, was able to give me foot massages because he had seen what they’d done." Donna went into labour five days after her reflexology session, on November 16, 2010. "I knew it was a slow labour but I just put myself back in the zone. My body seemed totally relaxed and I had Harley just two hours after going in. I think because I was very relaxed, and Anna talking me through the breathing, I could cope with the pain. "The reflexology certainly made a lot of difference and totally relieved the anxiety of giving birth. It was fantastic." 183 women with newly diagnosed, histologically proven breast cancer were randomised approximately 6 weeks after breast surgery to one of three groups. Intervention 2= scalp massage plus self initiated support (SIS) – comparator for physical and social contact. The treatments were for one hour at weekly intervals for 8 weeks. The scalp massage avoided the ears and neck where reflexologist’s believe there are further points. The reflexology and massage were standardised and provided by two therapists. The self initiated support was achieved by the patient visiting the Oncology Health centre whenever psychological support and services were required. All patients continued with conventional oncological treatment throughout. FACT (B) – Functional Assessment of cancer therapy - a quality of life scale frequently used in research. This comprises of two scales the general scale and the breast cancer concerns scale. Primary outcome =FACT The Trial Outcome Index (TOI) is a sum of the scores of the physical and functional parts of the general scale and the breast cancer concerns scale. Complementary medicine Questionnaire – CMQ – assesses concomitant CAM use throughout trial. SCID – structural clinical interview for DSM IV assessment of psychiatric morbidity using the anxiety and mood disorders section of this scale. Two different end points: 18 weeks and 24 weeks post surgery. Randomisation – 60 to reflexology, 61 to scalp massage and 62 to self initiated support. 75% received all eight sessions of intervention. At the primary end point of 18 weeks post surgery, the scalp massage had significantly higher TOI (indicating a better quality of life) than those receiving SIS. The difference between the two intervention groups was not significant. Scalp massage and reflexology on the MRS scales were significantly more relaxed than the SIS group. HADS showed no significant differences. The DSM IV showed no significant differences either. At the secondary end point of 24 weeks post surgery, reflexology was significantly higher than those on SIS on the TOI. Reflexology patients were significantly more relaxed than SIS patients on the MRS scale. In a recent study of breast cancer Eton et al determined minimally important differences (MID) in the TOI – this was set at between 5 and 6 points. The adjusted difference between scalp massage and self initiated support was 4.01 points. BUT the difference between reflexology and SIS was 5.4 which does meet the criteria. The criteria was only met after the secondary end point which suggests the effects of reflexology may take longer to show for those quality of life issues on the TOI. When compared to SIS, reflexology and scalp massage have statistically significant and for reflexology, clinically worthwhile effects on quality of life following surgery for early breast carcinoma. This is a really worthwhile study, showing a significant difference in the reflexology group in a difficult area to research. This is a trial of substance and carries weight as it is a randomised controlled trial showing significant differences. Control type: None – participants were offered the treatment after the end of data collection. 36 cancer patients over a period of time over 8 months. Participants were randomly selected and stratified to pain levels of low (2-4) high (5 and above) pain level on the self report pain level measure. 9 patients invited declined to take part. Reflexology was given two times 24 hrs apart to experimental subjects. A second person collected the data. The pain relief medication was calculated (equianalgesia) over 3 consecutive days. The subjects were also asked for a yes/ no answer to ‘I believe that foot reflexology will help to relieve my pain related to cancer’. – testing prior belief. Controls for data collection were offered a treatment after the data collection had taken place. There were 19 in the active group and these patients had a range of cancers. The majority of the sample was female and Caucasian. An analysis of variance of baseline adjusted post treatment measurements indicated lower pain scores in the treatment group immediately after the reflexology (p<0.01) but adjusting to the pain before treatment there was no significant effect at 3hrs (p=0.21) or 24 hrs (p=0.14). The prior belief question had no effect on the outcome of the reflexology treatment. As to analgesia use, there was an overall decrease in pain score after the first treatment but there was also an increase in pain medication use. This is probably the result of the increased medication. This is a small study but suggests there is an ‘immediate positive effect of reflexology for patients with metatstatic cancer who report pain’. The paper suggests that research needs to be carried out on whether the home carers for example family members, can be trained to give reflexology therefore being available for pain relief whenever necessary and at no cost. Evaluation of multiple treatments over time might then be carried out. Authors: Stephenson, N. L. Weinrich, S. P. Tavakolil, A. S.
30 minute treatment – specific areas worked – not a full treatment. Both contacts involved a filling in of a questionnaire. 48hours elapsed between the two, this is termed a wash-out period. SF-MPQ or short form McGill pain questionnaire which takes 2 – 4 minutes to complete and uses descriptor words for the sensory, affective and present pain dimensions. Well described in this paper. The 13 breast cancer patients had a significant decrease in pain. This could not be measured in the lung cancer patients as only two of them were in pain at the time of the study. Lung cancer patients showed the greatest decrease in anxiety (p=0.02) These were mostly male. Breast cancer patients showed a significant decrease in pain measured by the descriptive words of the SF-MPQ. there was only a small sample size involved. the lung cancer patients were not registering pain to begin with and they were a mainly male group. Great research paper which shows the value of a SINGLE treatment of 30 minutes. The use of a cross over trial is shown here. It is excellent to have the individual patients being their own control. The only problem here might be if there had been a longer term effect of the treatment. There is usually a ‘wash out’ period between active and control treatments of more than the 48 hours used here. It is a very positive trial. It used the traditional Ingham method. Authors: Siev-Ner I, Gamus D, Lerner Geva L, Achiron A. All patients attended the MS Centre, they were block randomised into groups by assignment of a sealed envelope containing either active or control. Each patient received 45 minutes of treatment for 11 weeks either individualised Reflexology or non-specific calf massage. 36 Reflexologists were involved, each treating one active and one control patient (removes the argument that it’s the effect of the specific therapist that causes the results). The patients were informed they were going to receive either sole or calf Reflexology. Clinical assessment was blinded and carried out before, at the onset of treatment, after 6 weeks, on completion and after an additional three months. Muscle strength – by British Medical research Council (BMRC) scale. Muscle tone – by Ashworth score. An open pre-study had calculated the sample size. 20 patients had been treated for six weeks and the difference in intensity of paresthesia was evaluated. The sample size calculation for the study used a projected improvement in 30% of the active group and 5% in the control. They study size was then calculated at 70 patients split between the two groups. Data analysis – by Wilcoxon rank test and Mann – Whitney test. Only patients completing the trial were entered into the results. 75% completed. There were no differences between the groups. There were variations of symptoms amongst individual patients. But comparison between the two groups showed statistically significant differences in the paresthesia (p= 0.01), urinary symptoms (p=0.03) and spasticity (p=0.03), while muscle strength showed only borderline improvement (p=0.06). The difference in the intensity of the paresthesia continued between the groups after three months of follow up (p=0.04). Reflexology resulted in an improvement of various symptoms of MS to a statistically significant level. No improvement was seen in the control group. Extraordinarily, the statistical improvement in spasticity and the statistically borderline improvement in muscle strength together are remarkable as the usual drug intervention for spasticity usually results in muscle weakness. The treatment was safe with no adverse effects noted. An excellent and positive study. The sample size was calculated in the first instance which makes it more possible to show a positive result if there is one to be detected. The patients involved in this study were all volunteers for either one or the other group. They continued to have their usual medication and treatments thorough out the study – all but two received hyperbaric oxygen therapy, a recognised treatment for MS. The levels of the severity of the MS ranged from capable of looking after self to wheelchair bound. An outcome measurement of a questionnaire was given to all the participants charting the 19 most common symptoms of MS, they were asked to fill in ‘minor problem’, ‘major problem’ or ‘not applicable’. The treatment group consisted of having one hour of Reflexology per week for 12 weeks. Both groups were assessed by the questionnaire: before treatment, at 6 weeks, 12 weeks and then 6 weeks after the completion of treatment. Everyone in the treatment group showed some improvement and all enjoyed the therapy. The main symptoms that responded were balance, bladder control, sleep, circulation, pain, pins and needles, spasm, constipation, feeling in feet and general wellbeing. After 12 weeks, 45% of the study group showed improvements compared to 13% in control. MS is a disease with variable symptoms sometimes effected by external situations. After a break of 6 weeks with no treatments the effects started to diminish. There were no dramatic results but lots of small ones that improved the patient’s quality of life and ability to cope with the disease. This is a non randomised trial with small numbers but suggests that Reflexology would be worth looking at for a bigger trial. Authors: Oleson, T. Flocco, W.
Outcome measurements were the monitoring of daily symptoms using a diary of 38 PMS symptoms, (19 somatic for example breast tenderness, 19 psychological for example anxiety) on a four point scale. One 30 min treatment per week for 8 weeks but total monitoring was over a period of 6 months, 2 months before; 2 months of treatment and then 2 months after treatment. There was quite a high drop-out rate because of the length of the trial. The placebo control was either overly rough or light stimulation of the areas of the ear, hand and foot deemed to be inappropriate for the treatment of PMS. The analysis of variance for repeated measures statistics carried out showed that there was a significant decrease in PMS symptoms in the real reflexology group as compared to the placebo group. This significant difference continued furthermore for the two months following the treatments period too. The changes and differences were in both the somatic (physical) and psychological areas. The discussion covers other trials of PMS and compares the results to this one. This discussion includes the trials of drugs too. A very good paper. Reflexology shows a statistically significant difference over and above that of a placebo control. It covers the unusual system of giving hand, ear and foot reflexology to the same client. NB this study is a preamble to a similar study in cancer patients so the group of patients selected were to mirror that of a group of cancer patients in age variability. 36 healthy individuals with an age range of 16-59 were used. There were certain exclusions mainly to do with adrenal illnesses, pregnancy and use of oral contraceptive pill. Trial B - expanded on measurements of the salivary cortisol and melatonin secretion. The timings of the sample collection were changed in the second study to include a sample on the next morning after the intervention. This was a cross over design with the individuals being their own controls, a three day wash out period between treatments was allowed. Outcome measurements were the self-reported anxiety index (Spielberger STAI), blood pressure and pulse rate, salivary cortisol and melatonin concentrations. These were carried out before and after the intervention (reflexology or sitting quietly in another room). The Speilberger STAI can differentiate between ‘state’ and ‘trait’ anxiety. ‘State’ being the temporary condition and ‘trait’ being more long standing. The trait score did not change on either treatment day or control day. NB this all within healthy individuals. Reflexology profoundly reduced the anxiety ‘state’ with a statistical significance of p<0.001 but has no effect on the underlying ‘trait’ anxiety. After the reflexology, there was a significant reduction in systolic blood pressure and pulse rate (p<0.001 and p<0.001 respectively) but no change in diastolic BP. No differences were found in salivary cortisol or melatonin secretion. NB p<0.001 is the most significant statistical measure you can achieve – it means that there is a less than a 0.001% probability that this result happened by chance. Methodology for testing the efficacy of reflexology in breast cancer patients has been validated. In addition a highly significant decrease in state anxiety in healthy subjects post reflexology was shown with a decrease in tension and worry and an increase in wellbeing. However, the effect of touch (thigmotropism) was not controlled for, which may have an intrinsic effect of reducing state anxiety. There was no effect on trait anxiety post reflexology or in the control, this may be due to the short duration of the study as trait anxiety is very much a long term issue. Systolic BP and pulse rate fell significantly in the post reflexology period which is consistent with a reduction in sympathetic nervous system activity which in turn supports a reduction in state anxiety. However the measured levels of secretion of these hormones were already low and so reduction might not be detectable. This may well be different in individuals that are unwell. This study does not detect whether the reduction in anxiety state is due to the reflexology or massage per se but the effects of the therapeutic relationship are reduced as each person only received one treatment. This is a good study, it backs up some of our claims regarding reflexology – a reduction in anxiety and related cardiac parameters and potentially a decrease in sympathetic nervous system activity. Authors: Wright, S. Courtney, U. Donnelly, C. Kenny, T. Lavin, C.
Qualitative research using evaluative comments. Descriptive statistics were utilised to categorise clients’ perceptions of the benefits of Reflexology with regards to QoL. These anecdotal findings may serve as a guide for further research based evaluation. This is a review of the effects on leg oedema of the different randomised studies for relief of this problem. Searches were performed through the Cochrane register of controlled trials, MEDLINE, and awareness searches through a further 67 journals. 4 trials were found that fitted the inclusion criteria. Administration of Rutoside (a drug) - 69 women at 28wks gestation – 300 mgs rutoside three times daily for 8 weeks – randomly allocated verses a placebo. Outcome was a subjective response to treatment by pain and paraesthesia reduction, and circumference of ankle. External pneumatic intermittent compression EPIC for 30 mins - 35 healthy pregnant women with ankle oedema – EPIC on one leg versus nothing on other, both legs lying left laterally. Outcome was leg volume using four measurements along the leg and a calculation. Measurements were taken immediately after the treatment and after a 10 minute walk. Prophylactic compression stockings- women with uncomplicated pregnancies at less than 12 weeks gestation. Two different stockinged groups were compared to a group with no stockings, the legs were reversed and the stockings worn to term. Outcomes were varicose veins and leg symptoms. Lymphatic reflexology – single blinded study comparing two different reflexology techniques, lymphatic drainage versus normal. Comparisons were before and after treatment, not intra group. Measurements were the ankle and foot circumference and also well being questions. The methods of the review are discussed here and how decisions were made. Rutoside was placebo controlled and showed an improvement in symptoms compared to placebo. There was significant decrease in pain, heaviness cramps and paraesthesiae. But only 37 women were given the treatment so insufficient to see if Rutoside is safe in pregnancy. The EPIC study may lack blinding- insufficient detail to tell and the results showed a non-significant reduction in leg volume immediately after the 30 mins treatment. The compression stockings trial was a partially blinded randomised controlled study . It showed an improvement of leg symptoms but not of prevention of varicose veins. This review provides very little help to those suffering from oedema in pregnancy. Rutosides appear to have an effect but it is not yet clear whether these are safe in pregnancy. The reflexology study was too small. The external pressure stocking has an effect but it is reduced quickly within 10 minutes while the prophylactic stockings help to prevent or improve leg symptoms but not varicose veins. Rutosides are not shown to be safe so cannot be routinely recommended. Compression stockings and reflexology show a trend in improving the leg symptoms and could be recommended to women with leg problems. All through the paper the authors are saying that the reflexology study is too small but then come up with the line in italics above! 25 right handed Japanese speaking individuals were subjected to functional magnetic resonance imaging fMRI of the brain. During the scan three reflexology points were separately stimulated. The three reflexology points were chosen because of their distinction on the foot chart and on the projection areas on the somatosensory cortex as defined by Penfield’s homunculus (this is a map of the points of stimulation for the various physical parts of the body on to the brain cortex). The three reflexology areas used were the eye, the shoulder and the small intestine. The stimulation was applied separately on all three points on each individual with a wooden stick by an ‘experimenter’ under auditory instruction via headphones from the imaging technician. All points stimulated were on the left hand food. The experimenter kept hold of the instep of the LHS foot while applying the stimulation. This was not much like a traditional treatment, it was very clinical, noisy and there was no therapist to reflexology point contact as they used a wooden stick, it is not even clear if the experimenter was a reflexologist. The sensory stimulation was measured by locating a region of interest as a peak in the haemodynamic response that appeared. Ie they looked for area of greatest blood flow within the brain. Eye specific point gave most activity in the middle part of the left post central gyrus. Small intestine gave most activity in the superior part of the left post central gyrus. The shoulder stimulation was not significant but gave a tendency for there to be an increased local activity in the superior part of the right post central gyrus. Also there are two common areas that activate, firstly relating to a tactile sensation in the LHS foot and a second one that may be involved with the perception of reflexology. If there is stimulation of the left hand foot eye reflexology point, the area of the brain that is responsive to the tactile (touch) stimulation of the eye or neighbouring area responds in the left brain. If there is stimulation of the left hand foot small intestine reflexology point, the area of the brain that is responsive to the tactile stimulation of the trunk responds in the left brain. If there is stimulation of the left hand foot shoulder reflexology point, the area of the brain that is responsive to the tactile stimulation of the upper limb has a tendency to activation in the right brain. It seems that usually if the LHS is stimulated in MRI studies then the RHS of the brain is activated, but in this study the LHS stimulation results in LHS brain activation from the results obtained from the eye and small intestine. This finding agrees with reflexology point of view that LHS stimulation results in LHS activation. However, in the case of the stimulation of shoulder reflex area, tendency of RHS activation was observed. But this was also the point that showed a tendency to activation rather than significant activation. Therefore, the laterality of activation is not conclusive from this result. Further research may increase clarification. This research is the beginning of understanding how reflexology can cause changes in the body. This is the reflexology point to brain end of the equation and it is not yet complete, as further research into this area is required especially to confirm the lateral effects. The other end of the equation is to see how the changes of blood flow in the brain as shown by this research effects the organs themselves. This still needs to be looked at, as does the whole equation - reflexology point to brain to organ. But it’s an exciting start. Type of study: Controlled trial – Reflexology is the control!!! 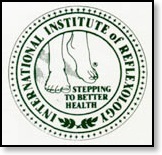 Number of clients: 128 participants; 43 in bulb irrigation group, 39 in cup irrigation and 46 in Reflexology. The idea was to determine the effects of two different methods of nasal irrigation and they decided to use home administered Reflexology techniques as a control. Remember a control is one that does not have an effect (these people are a Dr, a nurse and a couple of scientists). The two methods they looked at were hypertonic saline washes using a pot or a bulb syringe, and then self-administered Reflexology as a control. All included had chronic sinus illness and all groups had the same level of illness. They were instructed to use their normal medication and to take note of any changes in medication use. Outcome measurements used were medical outcomes study short form SF36 and the Rhino-sinusitis outcome measure RSOM31. All the techniques were shown on a videotape. The Reflexology involved four fingers on each hand and all five toes on each foot. They were told to use enough force to cause some discomfort. Treatment was 20-30 seconds on each point daily for 14 days. The nasal washings also continued for 14 days. The study contained 128 participants; 43 in bulb irrigation group, 39 in cup irrigation and 46 in Reflexology. There was a significant p=0.01 improvement in the rhinosinusitis score across all three groups. Gender may be important as 68% of the females improved while 84% of the males improved. The RSOM31 score was sub analysed and the Reflexology subjects improved as much as the irrigation subjects in each subset of symptoms. 65% of the reflex group said it helped their symptoms, 74% said they would continue using Reflex after trial and 76% said they would suggest it to a friend with sinus problems. As to medication 42% in the Reflexology group used no medication during the study while the other groups had 30% and 31% use respectively. 29% had decreased medication use compared to 33 and 42%. These numbers are not significant but self-administered Reflexology is comparable in all areas to the saline washing. This was obviously a case of it being assumed that self-administered Reflexology would have no effect on the sinus problems – nice to see that the investigators received a bit of a shock! It also makes you wonder what might practitioner administered Reflexology might be capable of. All required emotional support and attended the MIND day care centre in Worthing. Qualitative data collection over a period of 8 treatments. The Reflexology sessions were for 30min, counselling for 60mins. Inclusion: a variety of psychological and physical symptoms. Exclusion: a display of psychological symptoms that could result in damage to self or others. Open-ended semi-structured questions were asked in individual interviews before and after treatments. Focus groups were then held at the end of the project for the reiteration of themes. 80% experienced a ‘reaction’ at some point in the first 5 sessions, this reaction took different forms some were emotional eg crying, some physical eg worsening of eczema. There were a large number of physical improvements reported from eczema eradication to a reduction in high blood pressure. Most felt they had substantial increases in energy levels. As to emotional changes – 2 individual (4%) did not appear to benefit but most noticed large improvements. Many found their concentration improved. A large number found their motivation increased. Some felt they had an increase in self –esteem and confidence. Some felt they had improved communication. Many mentioned the importance of touch. Several reported they had been able to reduce their medication under the attention of the GP. Many other issues were discussed – the full booklet (53 pages) contains quotes from the individual and goes into a lot more detail. The study numbers are small and there was no randomisation and therefore they are not statistically significant. However, these results produce a valuable insight into mental health services user experiences and could be the basis of a larger trial. 6 treatments given over 6 to 12 weeks. Outcome measurements were both qualitative and quantitative. Qualitative; field notes taken after the sessions and analysis was based on conversational themes. Brief Psychiatric Rating Scale (BPRS) which measure psychotic symptoms. The mental health foundation had questioned the usefulness of the latter as it was felt to be rather focussed on illness. Questionnaires were filled in before and after all the Reflexology sessions. Only 2 of the six participants completed all 6 treatments and therefore answered the final questionnaire. 2 went into crisis and two dropped out of the trial. There were exclusively positive responses from five of the participants. No negative effects were noted. Positive results but these are not generalisable. The study was too small. The level of participation was reflective of their general pattern of attendance of this group of clients and not of the trial. It’s a small study but positive. Both qualitative and quantitative results show a difference. Good for understanding the problems of doing research in this area. This gives a definition of ‘concept analysis’ – a formal linguistic exercise to determine the defining aspects of a concept, to encourage communication. This concept is on the use of Reflexology for the empowerment of Mothers with difficulty in producing milk for pre-term babies. There is a definition of and importance of breast feeding and good flow chart of the hormones behind lactation. It’s a very useful for hand and foot reflex points involved in lactation. A positive, negative and borderline case history discussed. This paper shows that well put together case histories can be published in recognised journals. Reflexology, IIR, AOR, FFR Cert, International Institute of Reflexology, Association of Reflexologists, VRT, Vertical Reflexology in Derbyshire, Finger Free Reflexology, holistic therapies, complementary therapies, alternative health, relaxation, wellbeing, health, peace, calm, wellness, stress reduction, spiritual development, personal development, in Sheffield, Bradway, Dore, Totley, Nether Edge, Ecclesall, Norton, Meersbrook, Crookes, Walkley, South Yorkshire, Dronfield, Holmesfield, Coal Aston, Eckington, Derbyshire, Chesterfield, Brimington, Hasland, Newbold, East Midlands, Peak District, Hope Valley, Hathersage.